On 5 January, the first anniversary of the deeply contested 2014 elections, the most violent in Bangladesh’s history, clashes between government and opposition groups led to several deaths and scores injured. The confrontation marks a new phase of the deadlock between the ruling Awami League (AL) and the Bangladesh National Party (BNP) opposition, which have swapped time in government with metronomic consistency since independence. Having boycotted the 2014 poll, the BNP appears bent on ousting the government via street power. 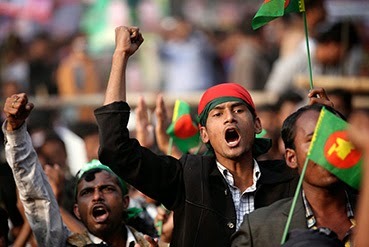 With daily violence at the pre-election level, the political crisis is fast approaching the point of no return and could gravely destabilise Bangladesh unless the sides move urgently to reduce tensions. Moreover, tribunals set up to adjudicate crimes perpetrated at the moment of Bangladesh’s bloody birth threaten division more than reconciliation. Both parties would be best served by changing course: the AL government by respecting the democratic right to dissent (recalling its time in opposition); the BNP by reviving its political fortunes through compromise with the ruling party, rather than violent street politics. With the two largest mainstream parties unwilling to work toward a new political compact that respects the rights of both opposition and victor to govern within the rule of law, extremists and criminal networks could exploit the resulting political void. Violent Islamist factions are already reviving, threatening the secular, democratic order. While jihadi forces see both parties as the main hurdle to the establishment of an Islamic order, the AL and the BNP perceive each other as the main adversary. The AL and its leader, Prime Minister Sheikh Hasina Wajid, emphasise that the absence from parliament of former Prime Minister Khaleda Zia and her BNP make them political non-entities. Yet, concerned about a comeback, the government is attempting to forcibly neutralise the political opposition and stifle dissent, including by bringing corruption and other criminal cases against party leaders, among whom are Zia and her son and heir apparent, Tarique Rahman; heavy-handed use of police and paramilitary forces; and legislation and policies that undermine fundamental constitutional rights. The BNP, which has not accepted any responsibility for the election-related violence in 2014 that left hundreds dead (and saw hundreds of Hindu homes and shops vandalised), is again attempting to oust the government by force, in alliance with the Jamaat-e-Islami, which is alleged to have committed some of the worst abuses during that period. The party retains its core supporters and seems to have successfully mobilised its activists on the streets. Yet, its sole demand – for a fresh election under a neutral caretaker – is too narrow to generate the public support it needs to overcome the disadvantage of being out of parliament, and its political capital is fading fast as it again resorts to violence. The deep animosity and mistrust between leaders and parties were not inevitable. Despite a turbulent history, they earlier cooperated to end direct or indirect military rule and strengthen democracy, most recently during the 2007-2008 tenure of the military-backed caretaker government (CTG), when the high command tried to remove both Sheikh Hasina and Khaleda Zia from politics. Rather than building on that cooperation, the two leaders have resorted to non-democratic methods to undermine each other. In power, both have used centralised authority, a politicised judiciary and predatory law enforcement agencies against legitimate opposition. Underpinning the current crisis is the failure to agree on basic standards for multiparty democratic functioning. While the BNP claims to be the guardian of Bangladeshi nationalism, the AL has attempted to depict itself as the sole author and custodian of Bangladesh’s liberation. The International Crimes Tribunal (ICT), established by the AL in March 2010 to prosecute individuals accused of committing atrocities during the 1971 liberation war, should be assessed in this context. While the quest to bring perpetrators to account is justifiable, the ICTs are not simply, or even primarily, a legal tool, but rather are widely perceived as a political one, primarily for use against the government’s Islamist opposition. In short, the governing AL is seen to be using the nation’s founding tragedy for self-serving political gains. the BNP should commit to non-violent political opposition; refrain from an alliance with the Jamaat-e-Islami that is enhancing the Islamist opposition’s street power with little political return for the BNP; and instead demonstrate willingness to engage in meaningful negotiations with the AL to end a crisis that is undermining economic growth and threatening to subvert the political order.